Gina E. Reviewed by Gina E.
Great cooler weather option with high waisted tights. Broad shoulders, size up! I usually do and am glad I did so here. Another item that I received and instantly ordered another! This has become my go-to rashguard for sup and surfing. For grappling/bjj, l layer it over a longer tank, because I prefer to have the coverage. But on the beach, I love having the option of protecting my sunburned shoulders while letting my tummy get some sun. 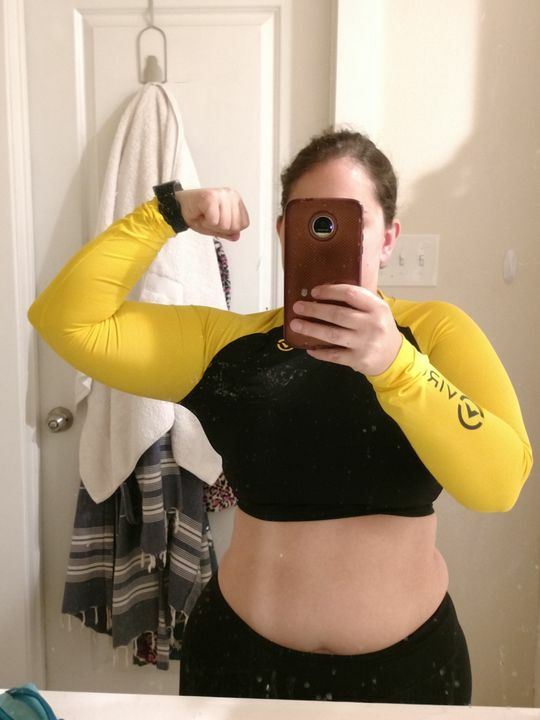 Stacy S. Reviewed by Stacy S.
The exact right amount of compression on my arms, and it stays in place for the whole workout. It gets a little warm, but the stay cool fabric is much better than other brands. I am a size S/M and ordered a size M top. It fits great, the material is real breathable. My absolute favorite addition to my fitness apparel!!! love the fit, feel and support!